With Memorial Day, the unofficial start to Summer, behind us, it’s time to lighten up- our wardrobes, our fragrances, our attitudes, and, with any luck, our schedules. As I was kicking off Memorial Day at DB Bistro in Miami, I rediscovered one of my favorite summer beverages, Rosé wine. 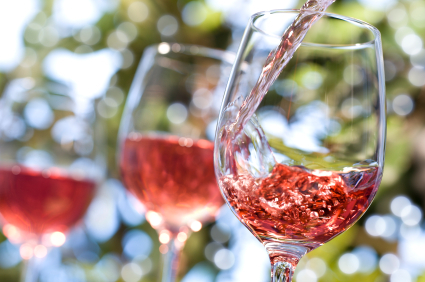 A rosé (from the French word rosé- ‘pinkish’) is a great wine choice for the season because of how refreshing it is. Dry or sweet (or dry and sweet! ), it’s the perfect compliment to an outdoor soiree, a good ole’ fashioned BBQ, or a day spent on the boat. Rosé does not necessarily come from France, as many mistakenly believe, but is produced in a variety of regions. There are three major ways to produce rosé wine: skin contact, bleeding the vats, and blending. Skin Contact: When the goal is to make rosé wine, this is the most common process. Black-skinned grapes are crushed and the skins are allowed to remain in contact with the juice for a short period, typically one to three days. The must (the skins, seeds, and stems of the fruit) is then pressed, and the skins are discarded rather than left in contact throughout fermentation (as with red wine making). Because the skins contain much of the astringent tannin, the wine that is created has a much lighter taste than red wine. Bleeding the Vats: Bleeding the vats (or Saignée) refers to the process of creating Rosé wine as a by-product of red wine fermentation. When a winemaker desires more tannin and color in a red wine, some of the pink juice from the must needs to be removed at an early stage in the wine making process. The red wine remaining in the vats is intensified as a result of the bleeding and the pink juice that is removed can be fermented separately to produce rosé. Blending: Blending is exactly what you’d guess- the mixing of red and white wine. This is the least common way to produce rosé. If you’re not familiar with rosé, fear not. I’ve listed a few recommendations at various price points below (along with the regions where they are from ) to quench your thirst and get you started on the road to rosé. Wine is subjective and there’s no better way to find your own favorite than to taste, taste, and taste some more. If you have a favorite, please leave a comment and spread the love to others.